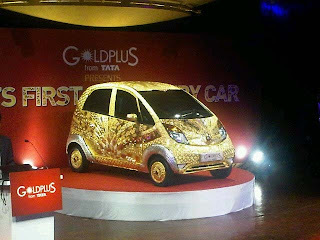 A company that owns a large chain of jewellery stores in India has unveiled a Tata Nano covered in £2.9m ($4.5m/€3.2m) worth a valuable substances. Goldplus said the design is an outcome of a competition announced late last year. We're not going to point out the irony draping the world's cheapest car in some of the world's most expensive substances. Around 80kg (176lbs) of 22 carat gold, 15kg (33lbs) of silver, and mixture of precious and semi-precious stones like rubies, pearls, emeralds, and black beads feature. The company is not looking to sell the car after its six month tour around India.